Man I have never had so much optimism hunting one buck, then had so many first hand encounters with him but have him walk away unscathed every single time. I named him Lucky and he seems to live a charmed life. On Saturday evening, my last night, I went back to my stand on the north end where he has been appearing every day. The wind was southwest and it was predicted to be that direction all evening. Anything with south in it is a bad wind for the stand on the south end, but SW is good for my north stand. I hoped this time he would come out within shooting range on the north end, and hopefully come down the trail at the stand for an easy shot. At 5:30 I heard a doe snort down at the south end of the field so I stood up and put my binoculars to my eyes. Lo and behold there stands a 10-pointer at the southeast corner of the field, a place where I had never seen him before. My heart sank. Then I got to looking at the deer closely and I became convinced it was not him. This deer looked like a 3-year-old and wouldn’t score nearly as high. So with my optimism back up, I held my vigil until about 6:30 when inexplicably, the wind changed to the southeast. Horrible for this stand I was in. In any other situation, I would have immediately gotten out and left, but it was my last day and I had no where to go, so I just sat it out with the faint hope that maybe it was my turn to get lucky. I did not. In fact, he didn’t show at all so I suspect he winded me and left. Lucky once again. 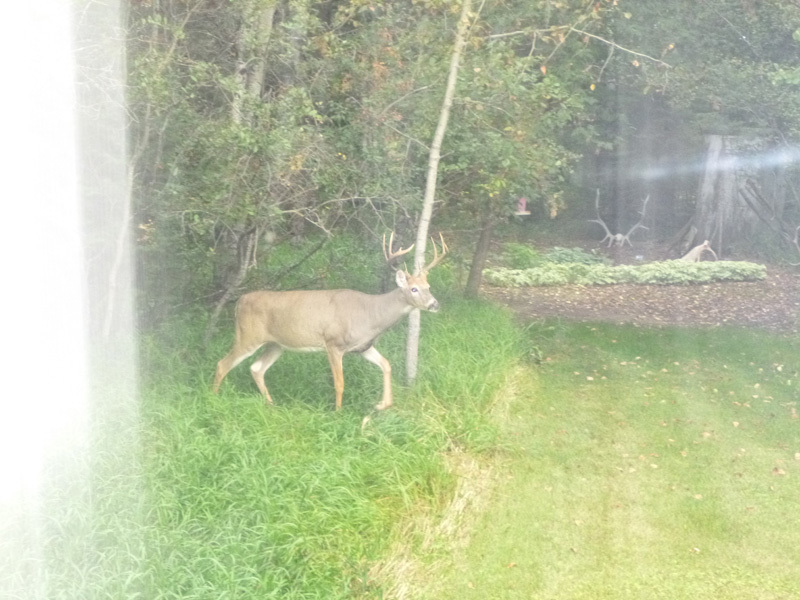 That deer down in the southeast corner of the field walked south right up into Tom’s yard where Tom took a few photos of him out of the picture window and from the front door as he walked across the yard. This is a buck for next year. What a fun hunt even though it was incredibly frustrating. I came so close to getting that big deer so many times, but it was simply not meant to be. I learned that Tom’s property has a lot of nice deer on it, even though I hardly scratched the surface. I found three mature target bucks yet I only thoroughly scouted about a third of his 1600 acres. I’m definitely going back to do this again. He tells me what I saw was nothing compared to what shows up during the rut, because he has a large herd of resident does on his property. 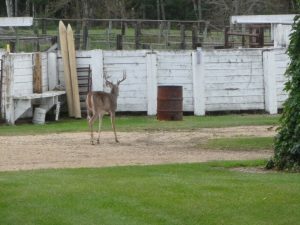 He guides a small number of muzzleloader and rifle hunters each year and the shoot quite a few 170 and 180 class bucks. I’m definitely not done deer hunting here.